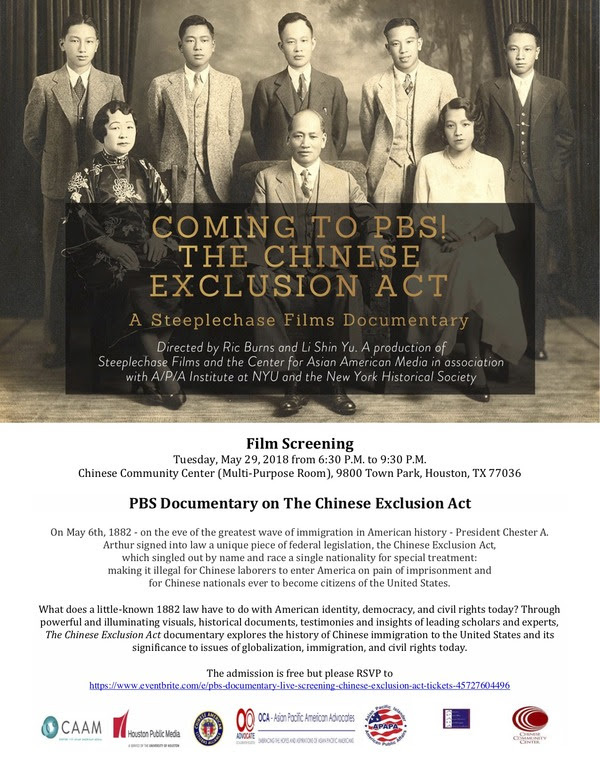 On Tuesday, May 29th, the PBS documentary on The Chinese Exclusion Act will be live-screened at the Chinese Community Center, 9800 Town Park in Houston, Texas from 6:30 p.m. to 9:30 p.m. Admission is free. This entry was posted in America Remembers, Asian Community, Asian Community Houston, Asian Community News, Community Events, Harris County News, Houston News and tagged Chinese Exclusion Act Documentary, Chinese Exclusion Act Film Houston, Chinese Exclusion Act Film Screening. Bookmark the permalink.